JEWTOPIA has been having a great run, and playing to an almost full house every night. That’s very good considering the show has been running since Jan 30th. This is our last week and we have been moved to the Gompertz Theatre a smaller 160-seat, for a one-week extension. Due to slow ticket sales for the extension, 5 of our 8 performances have been cancelled. Shows are scheduled for Tuesday & Wednesday, evenings and Saturday at 5PM. Thursday, Friday & Sunday are our relaxing days. Not too bad, although I would have liked to performed. Once the show closes I will have done 19 performances, been here 4 weeks and I loved every minute of it. 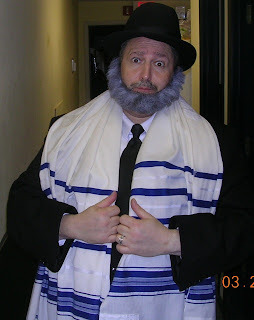 Playing a comical know-it-all Rabbi, and a sexually perverse grandfather. The style of the show is over the top stereotypical, so it was easy & a lot of fun. The other cast members have been very friendly in helping me fit in with the show, but I am still a replacement actor, so they really don’t buddy up to me outside of the theatre although they are friendly. Missing the rehearsal process was a disappointment, that is when actors bond, explore each other… etc. 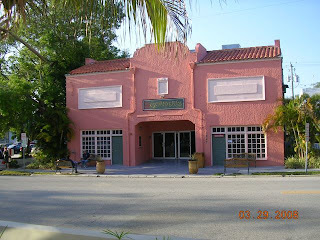 Like most Florida cities Sarasota has a small downtown area, but you really need a car to get many places. Company cars are available and cast members use them to get to the beach, restaurants, malls … etc. They call each other and do things after the performances and during the daytimes but no one calls me. I really don’t hold it against them, because of being used to habit-they were here for 2 months before me, but it would have been nice. I did ask a cast member to take me to the mall once and he was happy to do so, but I don’t want to ask, ask, and ask. I am from a different breed and also older (can’t believe I’m 51), so I don’t want to be the third wheel. I try hard to be “unconditional” in every thing I do, but sometimes it is difficult. I am thankful for my daily Kabbalah motivational emails every morning. A couple of cast members I would like to keep in touch with, they seem to be genuinely nice folk. The theatre staff and the stage manager & interns working on the show have been very nice & the interns put in a lot of work. I would come back again to do another show, can’t go wrong with the weather although it is very humid here, but that’s what air conditioners & movie theaters are for, right? On Mondays the Ringling estate is free to the public, except for the Circus museum, which is always $19. 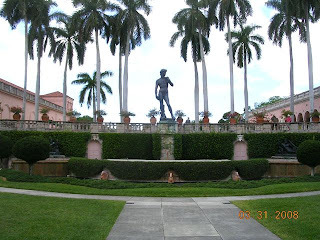 I took advantage of my last Monday here & went to the Ringling Art Museum & strolled around the estate. John Ringling (of Ringling Bros. Barnum & Bailey Circus) was very affected by the Italian, French & Spanish art whenever he traveled overseas that he started his own art collection here in the states, which include some original Rembrandts and Reubens. The art work was breathtaking. They also has a collection of Grandma Moses works and history that brought tears to my eyes. The museum has a sculpture garden with many re-creations including one magnificent statue of David, made from a bronze cast of the original. The grounds are sprawling with many Banyan trees, and a very opulent mansion. So for now, it’s been fun.